You’re off to great places. Today is your day! * On Oahu, Kauai, and Maui… Take a child to storytime! On February 25 at 10:30 am, the Storybook Theatre of Hawaii in Hanapepe, Kauai is celebrating their annual Read Across Kauai Literacy Day with storytelling in the Peace Garden Amphitheatre. On February 26 at 3 pm, the Mililani Public Library in Mililani, Oahu is celebrating Dr. Seuss Read Day, when special guest readers will read their favorite Dr. Seuss books. On March 2 at 7 pm, there are free storytimes at Barnes and Noble in Honolulu, Oahu and Lahaina, Maui. * On the Big Island… Spend an afternoon reading. On March 4 from 1 to 6 pm, children who spend time reading at the Hilo Public Library in Hilo, Hawaii can receive a free gift. * On Kauai… Sponsor a child or class to promote literacy and reading. The Storybook Theatre of Hawaii in Hanapepe, Kauai is hosting a two-month event that partners schools and classrooms with local authors. This year’s theme is environmental literacy. * Explore the science of flight with a printable 2015 classroom activity guide from Suessville.com. Younger students could design baskets that float using helium balloons, while older students could build their own hot-air balloons. Students could also design their own mazes or learn how to make simple machines to move objects. You could even plan a field trip to the Pacific Aviation Museum at Ford Island, Oahu – on May 16, they will host Open Cockpit Day when visitors can climb into the cockpit of a historical aircraft and talk story with pilots (kama‘aina admission is $15 for adults, $10 for children). 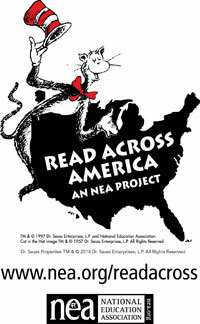 How will you celebrate Read Across America Day? Will you read a book to a child or with a child or ask a child to read to you? This entry was posted on February 24, 2015 at 5:00 am and is filed under Family. You can subscribe via RSS 2.0 feed to this post's comments.